With a clean look and ample illumination, recessed lighting is a must for nearly every room in the house. Understanding how to choose the right ones is the first step to a lighter, brighter space. Recessed lighting can be one of the fastest ways to update and illuminate a home. But done wrong, it can result in uncomfortable lighting or a dated appearance. It can be an intimidating project to take on in your home, but not to worry: Here, we’ve tackled the most common questions from our customers. Also known as can lights, pot lights or high hats, depending on what part of the world you are from, recessed lighting is a type of lighting fixture that is just that: Recessed. Generally, recessed lighting is composed of two pieces: The trim and the housing. The trim is the part that you can see from the room below, and comes in a range of finishes, sizes and shapes. The housing is the portion of the light that you do not see—it sits above your ceiling line. If you’re working with incandescent lighting, there’s also a third piece—the light bulb. These components are designed to work together, so it is important to choose a trim and housing that are compatible. Pro tip: Just because a trim and housing are the same size, it does not mean that they work together. Even trims and housings made by the same manufacturer may not be compatible. Always make sure that the components you choose are going to work together. Because there are many factors that determine whether components will work together, the best thing to do is contact a lighting expert (like us!). Why do I need recessed lighting? Plain and simple: For lighting! Recessed lights are a practical and elegant way to illuminate spaces that might not have been designed or built with enough lighting. Wash a wall with light to create a dramatic effect. APERTURE: An opening or hole, specifically referring to the cutout on a recessed lighting trim where light is visible. HOUSING: The protective safety covering around a recessed downlight. IC RATED: IC stands for "Insulated Contact." An IC rating is required for light fixtures that will be installed in direct contact with a building's insulation material in the wall or ceiling. TRIM: A decorative molding around the opening of a recessed light. BAFFLE TRIM: A style of trim with large grooves that absorbs excess light and reduces glare. Baffles are typically available in black (which reduces the most glare) and white (which reduces the appearance of holes in the ceiling). GIMBAL TRIM: A style of trim that allows control of the direction of light with a pivot inside the housing. REFLECTOR TRIM: A style of trim that uses a smooth, polished interior to maximize the amount of light. Can I use recessed lighting? While the recessed lighting systems of yesterday were sometimes thought to be clunky and complicated, today's options meet almost every need. New systems are not only performing to higher standards, they're easier than ever to plan and install. You’ll need someone who is familiar with residential lighting, like a contractor or electrician. He or she can help you with a lighting plan, ensure your lights are meeting any local codes and, of course, install the fixtures for you. Pro tip: Tight on space? Newer designs are getting smaller, with the same light output, therefore pushing the limits of where recessed lighting can be installed. 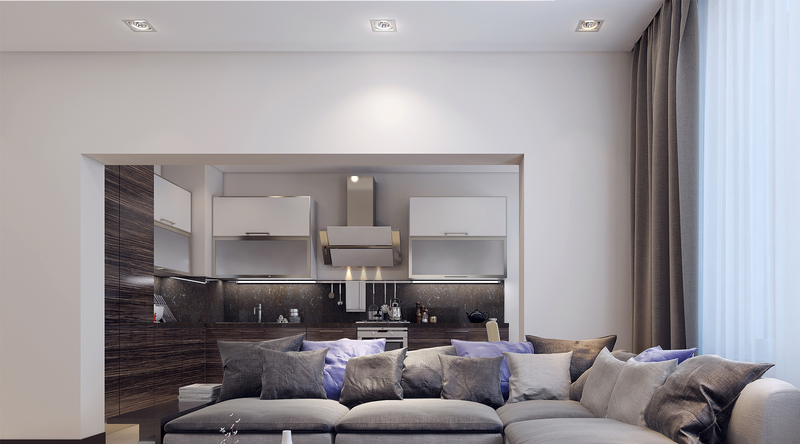 Even spaces with a few inches of clearance can now accommodate a recessed light. What size recessed lights should I use? There are a range of sizes on the market, and the size of your trim really depends on your application. When we look at trim sizes, we are generally looking at the aperture measurement. The aperture is the opening through which the light shines. Keep in mind that this dimension is not the overall dimension of the trim. Historically, the “standard” size used in many residential applications was a 6-inch aperture. Because of the popularity and widespread usage by contractors and builders, this size can look a tad dated. Newer trends indicate that a 3- to 4-inch aperture is the new standard. Current design trends are leaning toward smaller and smaller apertures. While they do tend to look cleaner on a ceiling, smaller doesn’t necessarily mean better. You’ll want to keep the size-to-function ratio in mind—smaller sizes (2- and even 1-inch trims) can be a great addition for detailing or highlighting a space, but would not be the best choice for lighting a whole room. Recessed lighting is, at its heart, an architectural lighting solution. This means that it is highly dependent on the space it is going into. The same lights that work brilliantly on an 8-foot ceiling will seem dim on a 15-foot ceiling. Working with your contractor, architect, designer or a Lumens lighting specialist will help ensure that you'll get the right product for your space. What type of recessed housing do I need? There are two main types of housings: Remodel and new construction. What you need is dependent on how they are being installed. As the names indicate, new construction housings are meant for spaces where the ceiling line, i.e. sheetrock/drywall, has not been installed or has been removed. These housings are designed to be installed between the ceiling joists. Remodel housings are for installations with an existing ceiling. They enter the ceiling through the hole cut in the drywall or sheetrock and are held in place using clips. Another rating to keep in mind is the IC Rating. IC stands for Insulation Contact. IC Rated housings can be installed with the insulation running up to or over the housing. This is especially important for spaces where the housing is going into an attic. Non-IC Rated housings will need a buffer or clear zone around the housing to operate safely. Pro tip: Know the codes and requirements in your area when building or remodeling. If you’re the one purchasing lighting for your project, make sure to clear it with your contractor, architect or Lumens lighting specialist to ensure that your choice will pass code in your area. What type of recessed trim do I want? The trim you choose should be determined by the application and your design aesthetic. Round trims have predominated for some time, but square designs are becoming more popular. Some options even include a decorative flange or lens that can be glass, metal or even crystal. If you’re trying to light a specific object or feature in a room, go for an adjustable or gimbal trim. These are designed to provide control in aiming the light. If you need a recessed light for a shower or outdoor space, make sure you look for a wet-rated or shower trim. These are designed to keep the fixture safe and functional in a wet space. If you’re using recessed fixtures for general lighting, even with downlight, you can keep in mind the color and shape of the baffle, which helps diffuse light better than an open trim. There are a lot of options for recessed lighting. While that can be overwhelming, it also means there is a trim out there to meet the needs and scope of your project. Should my recessed lighting be LED? There isn’t a clear yes-or-no answer here─but in our expert opinion, not considering LED when shopping for recessed lighting would be an unwise move. But, it depends on your project. It’s important to note that some states and municipalities require LED or high-efficiency lighting for projects that require a permit—so always check your local code before ordering. In cases where it is not required, it’s simply a matter of choice. Generally, LEDs will have a higher initial price point due to the technology involved. But keep in mind that, while they are more expensive to purchase, they also require much less energy to run and far less maintenance since they have incredibly long lifespans.